A cotton candy machine rental is a great way to add a carnival-like atmosphere and provide your guests with a tasty treat. 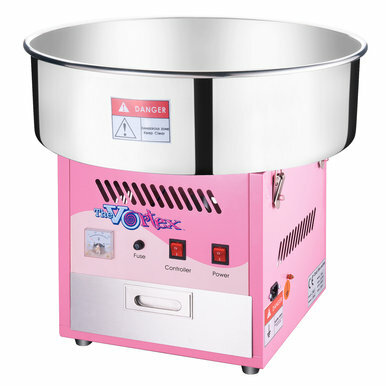 Our cotton candy machine is easy to use and we give you instructions upon setup so you won't have any issues. Our machine rnetal includes enough floss to make 25 servings, but we can provide you with as much as you need. Cotton candy is a favorite candy at birthday parties, fairs, festivals, and more. It's a light and fluffy sugar confectionery that resembles cotton. It's made by melting sugar and spinning it into fine strands. First developed over 100 years ago, cotton candy remains a crowd favorite at carnivals, amusement parks, and stadiums. With our cotton candy machine rental, you can now bring this tasty treat right to your own backyard. Why choose Best Jump for my cotton candy machine rental? Best Jump provides the easiest to use cotton candy machines and we stand behind them. They are all newer machines that are maintained and cleaned on a regular basis. We provide you with instructions and even a demonstration of how to use them so you will be condifent when your party gets underway. Should your machine deveop an issue during use, we will be their promptly to repair or swap the machine out. Why do I need a cotton candy machine rental at my party? Cotton candy brings joy to kids and makes adults feel like kids again. There's something about this sugary treat that just livens up the party. Where does Best Jump deliver cotton candy machines? Best Jump delivers cotton candy machine rentals all over St. Tammany Parish and beyond. We go to Mandeville, Covington, Madisonville, Slidell, Hammond, Ponchatoula, Pearl River, Lacombe, Folsom, Bush, Independence, Tickfaw, Robert, Abita Springs, and more. A delivery fee may apply to some of those locations, and minum order amounts will apply. Most of our customers rent a cotton candy machine along with inflatables or other amusements or games to meet the minimum order requirement and provide more entertainment for their party or event. If you're unsure about delivery to your area, please email or call us for more information or a custom quote for your event.